I went to my first homeschool convention when my daughter was only a few years old. Well, I’ll tell you what was going through my head – I wanted to homeschool. I wanted to convince my husband that we should homeschool. And I wanted to plan ahead so that we would have an amazing homeschool journey. 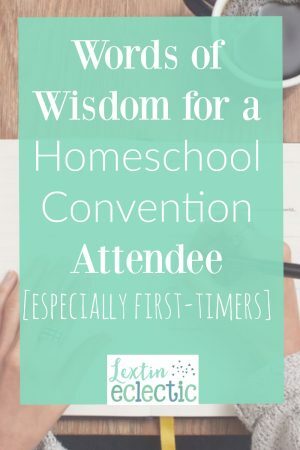 Looking back, I’m somewhat thankful that I experienced my first homeschool convention years before I actually needed to purchase curriculum and buckle down for formal schooling. That year I spent my time browsing the vendor hall and listening to speakers. I spent my time feeling completely overwhelmed and slightly panicked. How would I ever choose curriculum and start our homeschool journey? Was I truly capable of doing this? Was I crazy? Yet, I’m still glad I attended that convention. Do you remember your first homeschool convention? Did you have a deer-in-the-headlights look in your eyes? Now that I’ve attended conventions for several years, I can usually spot a new homeschool mom at a convention. She has that slightly panicked and overwhelmed look on her face. I can pick her out from the crowd because I remember being her just a few short years ago. Occasionally I’m tempted to walk up to one of these moms and give her a quick hug and tell her that she can do this – I feel compelled to launch into a motivational speech. But I don’t, because I don’t really want to be labeled as a crazy woman (and also because I’m an introvert and I don’t really DO hugs). But I know what I’d tell her – because it’s the same thing I would have told a younger version of myself if I saw her at a homeschool convention. Whoa! You don’t need every art program or all the science kits. Go back to the basics and start there. Find curriculum for the key subjects of language arts and math as a starting point. From there, slowly branch out into history and science. Only add the extras once the basics are covered. Those key subjects are truly the most important anyway, especially in the younger years. Stay focused! Come to a convention armed with a list of the subjects and products that you think you might need. Don’t be distracted by all the fun extras. Starting with the extras is the surest way to break your budget and cause a feeling of overwhelm! All vendors love their products and yes, they are trying to sell them to you. Don’t be afraid to say no if you feel like a program won’t work for you. Only you know your children and your homeschool vision best. Stay strong against the most compelling sales pitch and only purchase curriculum that seems doable and functional to you – no matter how wonderful it may sound. You will make curriculum purchase mistakes. Ouch! They can be painful, but they are part of the learning process. Take a deep breath and make your purchases, and if they don’t work out as planned, give yourself some grace. Homeschooling is a learning process! Homeschooling is doable and can be successful. So, RAH RAH, you’ve got this! However, I’m going to be honest, homeschooling is a ton of work. Take it one step at a time, don’t overload your schedule, go easy on the curriculum, and work at your child’s pace. You can become burned out and exhausted. Find your balance. Enjoy the convention experience and do allow yourself a couple of splurge purchases. Homeschooling should be enjoyable. Choose products that inspire and motivate you as the teacher. That excitement and inspiration will help carry you through the homeschool year. There you have it! If you are a newbie homeschooler and are attending one of your first few conventions, know that these are the very things I would say to you if I saw you struggling through the vendor hall with a handful of brochures and eyes full of fear. I wish someone had sat me down and given me a little honesty. I was so fired up and excited about this homeschool thing that I plunged in full steam ahead and found myself overwhelmed and burned out. This is a marathon, not a sprint! Plan accordingly. Know that you can do this with a lot of hard work and a lot of motivation. Soak up the encouragement and use your excitement to carry you through each school year. Are you planning for your homeschool convention experience? Be sure to read my entire Convention Planning Series! I think homeschooling is one of the bravets things a mom can do! – Moms surely need wisdom and patience to develop a homeschooling environment. Great post and great advice from your own experience! Thank you! I hope it helps moms as they plan for their next convention. Homeschooling can be overwhelming so it’s best to make an informed decision as you begin. Having had a neighbour that was homeschooled, this definitely put a new perspective on why her parents chose to do it. Thank you for enlightening me about homeschooling! You’re welcome! There are many different reasons to homeschool and homeschooling can be wonderful. But it’s not without challenges!